In M AKE ME, TAKE ME, Book 3 of the Hot Nights series, Betsy goes on a bender in New Orleans and literally tries to drink the ROYGBIV rainbow! She makes it through blue and is headed for indigo and violet before the hero catches up with her…and buys her a sandwich. Because that’s what a real hero would do, right? God, I love Quin. 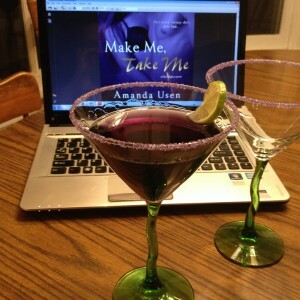 In honor of heroes, sandwiches, hot books, well-deserved benders, and the impending New Year, I give you the MAKE ME, TAKE ME Martini! It’s author-approved, almost as purple as the cover of the book, and totally quaffable. ENJOY! Put the purple sugar on a plate. Run a lime wedge around the rim of the glass and dip the rim in the purple sugar. Measure juice and liquors into a shaker full of ice. Strain into glass and garnish with the lime wedge. *But be careful! Notice the recipe is 3 shots booze to 1 shot juice. POTENT!